While we can't quite use lightsabers just yet, there's no reason something similar can be made and put to use in the kitchen! 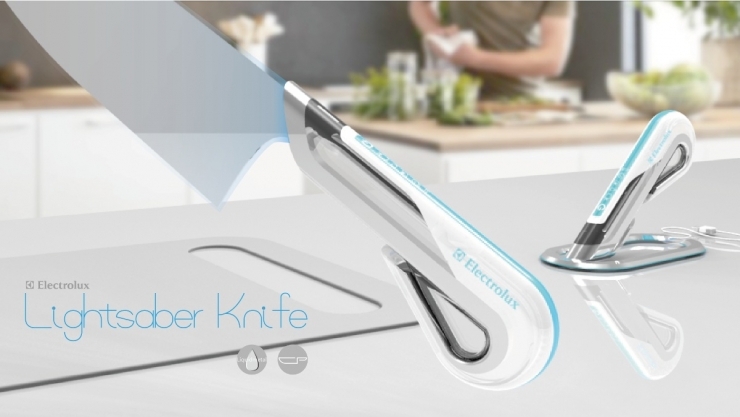 Designer Chia-Yu Yeh's Electrolux Design Lab entry is a concept called the Lightsaber Knife. The knife is a handle that generates whatever blade you need to whip up a meal for yourself. All you have to do is press a button on it and it will intelligently morph its liquid metal blade into one of five specially-designed shapes. Sounds pretty awesome. Yeh also designed her concept to be safe from kids, where it includes a fingerprint scanner to keep it from being used as a potential weapon. Unfortunately, such liquid metal like this doesn't quite exist or isn't available for designers like Yeh to play around with.